There's a point in Dan Jurgens's Justice League International: Breakdown where Booster Gold and Guy Gardner are sparring, when they're talking about the "other" Justice League, or even when Batman's being threatened by a prominent pre-Flashpoint foe, that it's easy to forget this all takes place in an "alternate" New 52 reality. Yes, Guy and Ice haven't dated quite as long and yes, Booster and Fire aren't as good of friends, but as one might've expected would happen, at some point there comes a certain "leveling out" in which these same characters, with similar personalities and in similar situations with the same teammates, simply revert to their pre-Flashpoint selves. As a title, Justice League International very obviously lacked the drive and modernity to succeed. Fans of Booster Gold and some of these other characters, like the Great Ten's August General in Iron, will enjoy their appearances here, however, and hopefully this book is indeed a launching point for some of these characters to appear again later elsewhere. The greatest difficulty with Justice League International: Breakdown, illustrative of the title's problem as a whole, is the central villain, actually named Breakdown because of his meta-human abilities. Breakdown is an authentically frightening-looking figure in his rust-colored suit and tattered black cape, as depicted by Aaron Lopresti. But Jurgens teams Breakdown with a trio of distinctly un-frightening henchmen — Lightweaver, Intersek, and Crosscut — each of whom Lopresti gives a dated 1990s appearance; the young Crosscut, who compares fighting the JLI to playing video games, is especially annoying. Despite some rather startling deaths in this title, the villains always seem ridiculous (including Breakdown, who looks out of place in the constant daylight battles) and so in connection the JLI also seem ridiculous, and ultimately the book itself comes off as less relevant and "in the moment" than Justice League or the new Justice League of America. 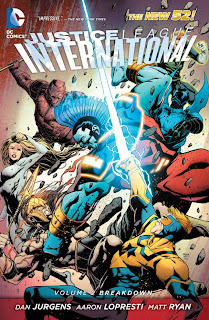 Neither does Jurgens ever quite make full use of the "International" aspect of Justice League International, which in this day and age would probably bear exploring (versus, for instance, Greg Rucka's superlative international politics and use of some of these same characters in his Checkmate run). The villains are meant to be driven by a certain "Occupy" mentality, but their complaints seem rather surface-level and it's never quite clear why they should oppose a team of UN-sanctioned heroes who publicize their own identities. "Occupy" was equally poorly-depicted in Ann Nocenti's Green Arrow: Triple Threat and possibly this is a trope DC Comics should start avoiding, Gail Simone's upcoming Movement comic notwithstanding. What's enjoyable about Justice League International is, again, simply seeing some of these characters together. Jurgens has written Booster Gold and Guy Gardner on and off for years and he knows how they work, and his Guy, especially, is nicely layered as reflects the way that depictions of Guy have changed over the years. Jurgens takes a curious step in sidelining four members of the original team at the beginning of this book (and killing two supporting characters), replacing them with just two new ones, such that Interational Vol. 2 almost feels like a different book with a smaller, more compact team. It's equally fun to see new favorites like Batwing and OMAC alongside Booster and Guy; in that one attraction of team books is to see lots of costumes together, this has that in spades. Geoff Johns and Dan DiDio's International Annual at the end of this book may be the highlight, though it's unfortunate Jurgens or at least Lopresti couldn't have taken a hand there too. It's a tad confusing — one really has to be up on the final events of OMAC to follow it — but the threat to the League is at least more pronounced. There's also a bunch of continuity teases at the end — this is, perhaps, the best part — that will gets fans salivating for wherever these plotlines should show up next. Breakdown is an interesting read also because it is, as the name implies, the story of a team breaking down (Jurgens, ironically, came on to the old Justice League America title just after it, too, went through the era-ending "Breakdowns"). At the beginning of the book the team is essentially fired by the UN, and though the spend these pages tracking down the villain who attacked them, they arrive at the end still fired and going their separate ways. It would seem Jurgens received a lot of lead time to end the title (this is essentially a seven-part finale), or else perhaps Justice League International was never meant to amount to more than this; there's hints of the old continuity in the first volume that suggest maybe International was already in the pipeline when the New 52 hit, and perhaps six issues already-prepared and six issues to close it out were all we were ever supposed to get. International crosses over with Fury of Firestorm in these pages, too, but I almost found myself wishing DC had held back the Firestorm issue and only printed it in Firestorm Vol. 2: The Firestorm Protocols instead. At the end of one International issue, the JLI leave for Paris thinking Breakdown is responsible for a crisis at the Eiffel Tower; in the Firestorm issue, they too-conveniently find a rogue Firestorm causing trouble instead. When, in the next International issue, Guy complains of their "wild goose chase," Jurgens is being too honest; this is a thin crossover for crossover's sake, and one that deals more with the events of Firestorm than it does with the Justice League. Again, if you like to watch Booster Gold and Guy Gardner bicker, or if the August General knocking around with OMAC and Batwing is your idea of a good time, Dan Jurgens's Justice League International: Breakdown delivers an enjoyable superhero team story for a weekend afternoon. This is not a blockbuster action story of the likes that Geoff Johns and Jim Lee produce, and maybe that's an attraction for some, but in the end Justice League International needed to deliver more to really be a contender. Tomorrow, our last Saga of the Swamp Thing review. Don't miss it! The fact that DC cancelled this series after only 12 issues, even though it had decent sales and was nowhere near the "cancellation threshold", was very strange. I guess they just didn't want an UN-sponsored Justice League co-existing with a US government-sponsored version. I feel sorry for Jurgens, though, because DC has really been jerking him around over the past few years. In addition to having this book cancelled in spite of its good sales, he was removed from Green Arrow after just 6 issues, did 6 issues of Superman before getting replaced by Lobdell and Rocafort and then got the thankless task of trying to save Firestorm, which just got cancelled, too. I hope he isn't plagued by the same fate as Jerry Ordway. Jurgens is part of the problem, not the solution. DC needs to stop putting retreads like Lobdell, Nocenti, Nicezia, Jurgens, Perez etc on their books. They need to look at new and fresh creators. Look at their best books and see who the creative teams are. They aren't people left over from the 80's and early-mid 90's. There's a reason these guys are not being offered jobs at Marvel. I did, as a matter of fact, give a thought to the recent column by Jerry Ordway on how creators of a certain vintage or tenure struggle to get work, as I wrote this review. I really like a long spread of Dan Jurgen's work, and the man himself is far from an "old" creator, but this volume of JLI did strike me as something that would better sell in 1990, dropped with a thud in the 2011s. I agree wholeheartedly that DC owes these creators -- Jurgens, Ordway, Perez, etc. -- a debt, but in general the work has to grow with the times, too. Keith Giffen is surely a good example -- his work was big in the 1980s, but he equally wrote an edgy, bang-up Doom Patrol just a couple years ago. I had not read the article until you posted the link CE. While I sympathize with Mr. Ordway's plight, I have to disagree with him. DC comics does not owe any creator more than what they are contractually obligated to. DC comics is making comics to make profit. They will put creators on the books that they feel will help them do that (unless you are Bob Harras, and then you hire your friends and supporters from when you worked at Marvel in the 90's). Work for hire is a tough business. You are competing with a lot of other artists/writers for a chance to work on a finite number of books. If DC or Marvel felt that the Jerry Ordway name/brand would help them sell comic books then he would be working. Lots of writers/artists disappear from the comics scene in a much shorter time then Mr. Ordway. His longevity is the exception and not the rule in the comic book industry. I liked this volume, as I did the last one. Of course, it wasn't as good as Winick's generation lost or Jurgens' Booster Gold, but all in all I liked it. Hopefully, Jurgens will get another gig at DC soon, where he can stay on for a while and build something like he did with Booster.